the service or offer you are making on this slide. The 12 Laws are amazingly simple. They are tried and true. And when you begin at the beginning, with Law #1, reading and DOING, taking action and moving forward each day toward your goals, massive miracles can be manifested in your life! We believe in miracles. We believe in little ones, medium-size ones, and massive miracles that take your breath away. 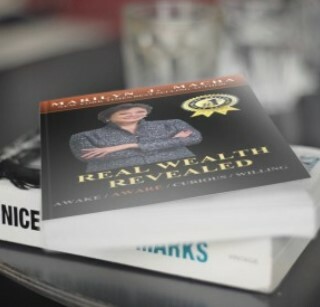 "Marilyn Macha transformed my life and my business by empowering me through my own strengths and bringing awareness to my thoughts and desires. Her expertise on how our brains work and rewiring our thoughts allowed me to break through limitations I had set for myself. I will always be grateful for her role in my life and still lean on her for clarity and shifting. She is a true support system in helping visualize and then create the reality of what I truly want in my life and am now living daily." 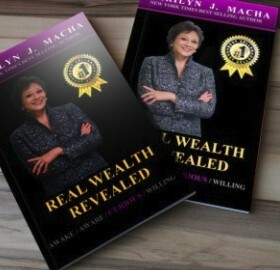 "Marilyn Macha is one of the most caring, talented, successful mentors I've ever worked with. She has a unique and powerful combination of expertise in corporate leadership, team building, full spectrum life success and a deep understanding of the universal laws of transforming one's results! She beautifully fuses together a heart-centered and results driven coaching style. If you are looking to transform your life or your business, Marilyn comes with my highest recommendation. " "I bought this book and couldn't put it down. The truths resonated with my inner being as Marilyn spoke of the importance of learning to listen to our inner self and importance of not living the baggage of our past. Marilyn Macha shares from her heart and it makes you see the importance of learning." "Marilyn Macha is one of those rare people on this earth, that if you have been fortunate to be in her presence you know what I mean. 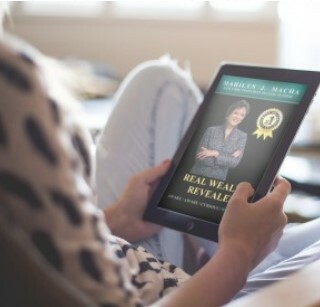 She is Brilliant, intuitive, caring, supportive and most of all, will help you create massive needle moving results in your business and your life. I've had the fortunate pleasure of working with Marilyn for over a year and she has helped me create results that I thought were unimaginable. From an idea which was my hobby, building it into a multimillion dollar business in just over a year. I could not have done this without Marilyn's genius guiding me. To my health and relationships which were good but now they are GREAT. 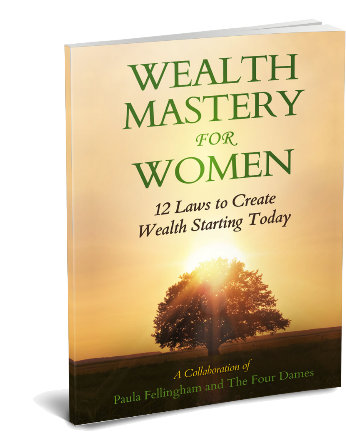 She has given me the tools to create a life I never thought was possible. If you get the rare opportunity to work with this amazing woman don't think twice. Seize the opportunity, you won't regret it! "I have been working with Marilyn Macha for over three years now as my coach. She keeps me focused on all possibilities. I continue to be amazed at the opportunities opening up to me. I have become a high profile figure and leader in our community, Gwinnett County, one of the fastest growing counties in the Atlanta area. I know that without Marilyn's guidance and vision for me these type of things would not be happening. She encouraged me to reach for something bigger than where I was. It has been a fun and fulfilling adventure! I would recommend any advisor that wants to expand and grow professionally and personally to invest in themselves and work with Marilyn. " "What Marilyn and I accomplished over two years is immeasurable. She is an amazing teacher. Her program has helped me to identify and to achieve a life of "focus, ease and grace" and that will continue to be my mantra. The ripple effect has been felt on all fronts; mind, body and soul. When I reflect on the last two years and the easily identifiable accomplishments; completing a triathlon sprint, doing not one, but two, Chesapeake Bay one mile swims, getting my RICP designation, going on a mission trip to El Salvador, I know that Marilyn had a part in all of that and more." "Marilyn is a true professional with a wealth of experience and incredible insight. She also happens to be an amazing person with a beautiful heart who brings joy to every interaction. Her impact personally and professionally is dramatic." "When you are working with Marilyn, you have a champion in your corner who guides you with compassion, humor, and gentle firmness." "So glad to have a chance to comment on your wonderful book as it reminded me of how many times Intuition and Awake worked for me really without me knowing what was really happening. Thank you so much for explaining it all in such simple terms." Once you are Awake to the fact that you can be conscious of your thoughts, then the next step is to be AWARE of what is automatically there in your thoughts; to notice what you're thinking. Without being aware, you run the same patterns day after day, creating the same life over and over. Being AWARE gives you greater structure to fulfill all of your desires. When we look at "getting CURIOUS" it is really all about asking ourselves questions - questions that move us in the direction of our desires. To get CURIOUS (not judgmental) of what we are thinking. Being introspective and truthful with ourselves, we find ourselves being more curious about what has meaning in our own lives and living a life of purpose and joy. Release and repatterning WILL commence when you are Awake, Aware and Curious about your thinking. Being WILLING is then mandatory to shift our lives and our results. When you are WILLING nothing can stop you, unless you make an agreement to get stopped. Being WILLING to make new choices, those necessary in both our thinking and our behaviors, to create a new life, we begin to take action where we have stopped before. We are WILLING to think thoughts that our imagined life requires and do what it takes. New and seasoned business development, account specialists, sales professionals, recruiters or whatever your position/title is that centers around selling and growing your revenue streams, business, membership or portfolios from new or existing clients. If you want to learn the fundamentals or be reminded of the fundamentals to selling and relationship success in the selling world, this is the high impact, energized, program of proven strategic and tactical selling program used exclusively by the Fortune 100, major Associations and the United States Military recruiters for decades. This is a two-day action packed professional development experience, no up-selling, hype or infomercials â€¦ Just real world KPIs and ROI for you to put into action even before you leave! Imagine leaving this program and improving your net results by a factor of 4X, 6X and even 12X? That is exactly what our clients over the past 30-years have quantifiable reported. An author of more than 20 books, three college graduate management text books, four best sellers, and is the Publisher of PERFORMANCE/P360 Magazine. Former Co-Host of the national business entrepreneur program on Catalyst Business Radio and a Human Capital Developer for more than twenty years. You are free to choose the concept you will accept of yourself. Therefore, you possess the power of intervention, the power which enables you to alter the course of your future.